At Ryders Row, Dublin 1. 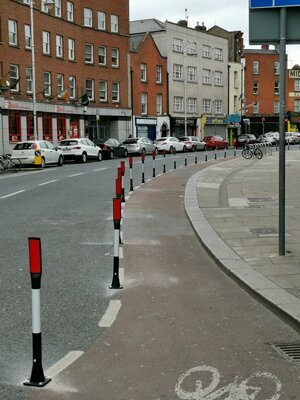 Bike lane protection added on the top of Capel Street and Ryders Row – FYI. The cyclist in the first photo is cycling in the wrong direction, right? 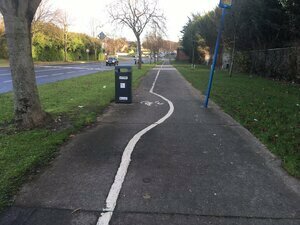 I think it’s supposed to be a contra flow lane. The bicycles should be painted facing the other way. 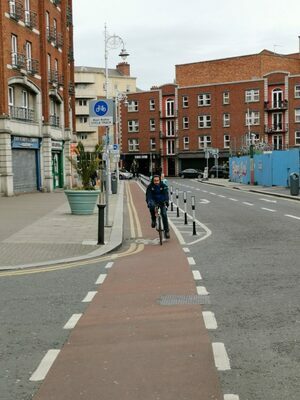 Posted in Misc and tagged Bike Lane, Dublin, Ryders Row at 1:51 pm on April 15, 2019 by Bodger. How do you know he doesn’t have a drivers license? He’s a Dublin cyclist. The only rule is to survive the maniacs driving. And surprise. The two rules are: surviving the maniacs driving, surprise and a fanatical devotion to the pope. If road markings told cars to drive in both directions in the same lane there’d be some complaints too. Excellent point. But still, someone here is just dying for an excuse to take a crack at cyclists. I am merely facilitating that, like the good citizen. You appear to be the only one having a go so far. The others will be along shortly, no doubt. They’re determined to thwart me, obviously. Too wet, no doubt. something something something , red light …. You don’t have to put on the red light?